Termicide work closely with Property Management Agencies to ensure a pest-free environment is the outcome at the property in question. In many States the legislation relating to pest control can be very unclear and is often open to interpretation. A tenant is responsible for keeping the property clean, while the owner is responsible for maintaining the property in a safe state of repair, fit for the tenant to reside. Most pests would become the responsibility of the property owner, with the exception of it being clearly proven that the presence of the pest was caused from the tenant’s lack of cleanliness or poor house-keeping. If the tenant was not disposing of perishable rubbish or was undertaking activities that increased the presence of pests it could be argued that it is a tenant responsibility. You can feel confident knowing that your clients, both Owners and tenants will be corresponding with a punctual and reliable pest control company that respects property managers, landlords and tenants alike. You will receive a confirmation that the work order has been received. Same day response to get in contact with your clients. Confirmation as to what days the work will be taking place. Preferred rates for all owners going through your property management. 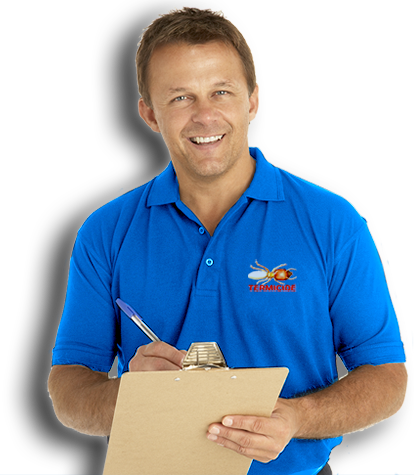 Termicide will deliver peace of mind all-round by delivering expert Pest Control Services.